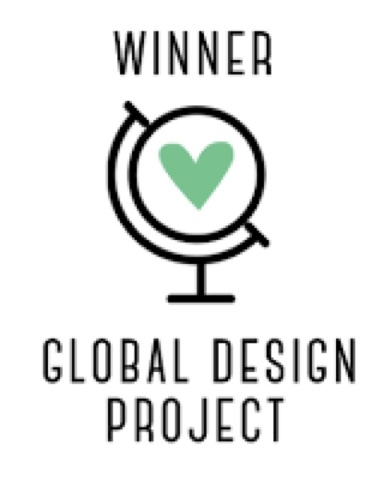 UPDATE: I've found out that I was selected as a winner of this challenge! Thanks GDP! Hello everybody! I'm just dropping in for a quick hello! Today I've got a fun share for you using some of the new products from the holiday catalog. Check out this french horn...! And here's what I've made using her card as inspiration. I needed to make a music themed card to go along with a donation that I'll be making tomorrow. My son used to play the trombone in the school band. I'm talking like four or five years ago and his trombone has been hanging out in his closet ever since. I really wanted to donate it to somewhere that would really put it to good use. Finally I found the right place and thought I would write a card to go along with my donation. This card was so much fun to make and is so sparkly in real life... but boy, oh boy, was this sucker ever hard to photograph! 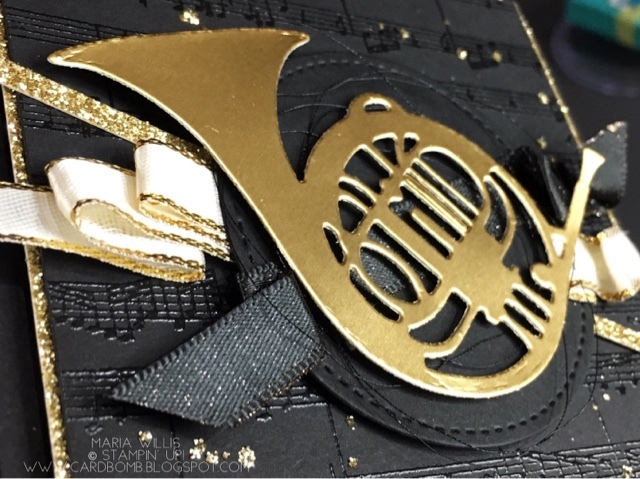 I knew I would be using this French Horn from the Musical Instruments Framelits Dies as the focal point for my card. 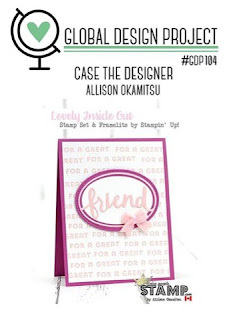 It's really the perfect shape for me to use Allison's layout as inspiration. Under the horn I've layered gold glimmer paper, Gold Metallic Edge Ribbon, Basic Black Glimmer Ribbon (it has gold flecks! ), a basic black stitched circle and basic black metallic thread. I used mini glue dots to hold the folds of the ribbon in place to give them dimension. 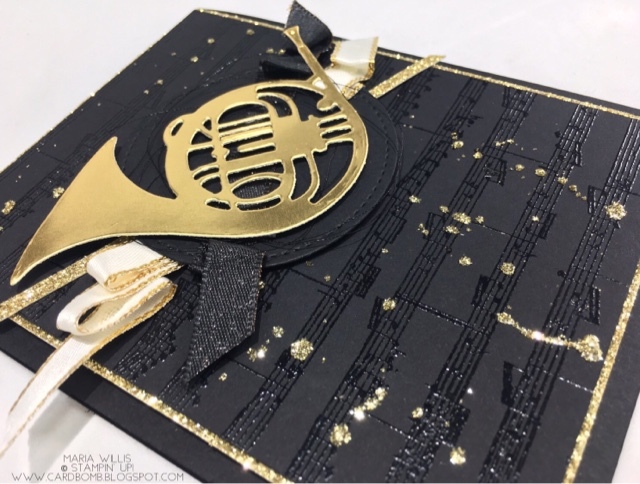 I heat embossed the Basic Black background in clear using the new Sheet Music Background stamp. I love the way it shines without being too overwhelming. Then I watered down some Tombow glue and splattered it on the background so that I could add gold glitter to it. 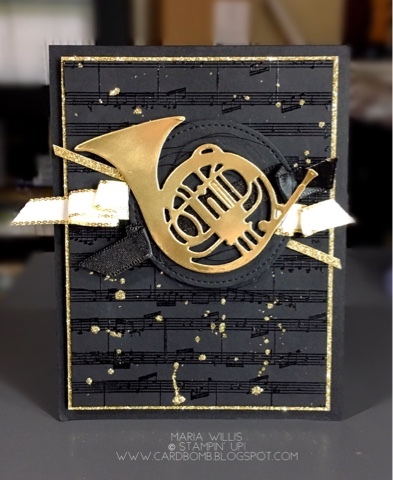 The basic black background is layered on Gold Glimmer paper and then added to a card base of Basic Black. 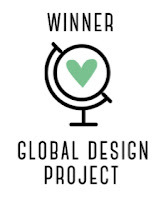 There are tons of great projects over at #GDP104 this week so if you're looking for some inspiration, or maybe even a challenge, head on over to the Global Design Project Blog. Both the design team and challengers have all made some amazing projects so it's sure to be a fun browse. Ok, that's it for today! I'm off to make dinner...which will be hard since I didn't go grocery shopping today. Whoops! See you soon! Thanks for stopping by-you know it always makes my day to have you visit. A really lovely card and such nice colors. Love the gold and black! Absolutely Stunning! WOW! Love all the little details you have used to create this beautiful card!! Beautiful layering and textures, Maria! I love this! Thanks for playing along with this week's GDP challenge.